Peepshow toys fit well into our interest in optical or philosophical toys. They have multiple relationships to the development of photography and cinema. 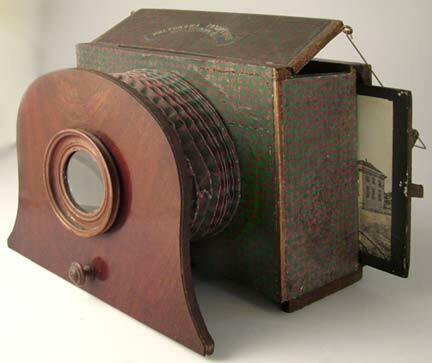 Not only do they show how people in the past experienced images and movement but also relate directly to Daguerre's interest in the development of a practical photographic process. The toy we treasure most is the French Polyrama Panoptique on the right, which relates to the idea of Daguerre's Diorama. When doors are opened and closed on the top and back the pictures change from day to night. Below left is one of its images showing a train station with a "day to night" effect. On another page we show our prints of Daguerre's Paris and London Diorama Buildings. Additional peepshow changing views are shown on another page. *Note The Carlo Ponti Megalethoscope from our collection that was shown on this page has gone to a new home! After we posted the picture here we learned that its smaller size (just an annoyance to us because we could not find any of the day/night photographic views made by Carlo Ponti of Venice to fit it) made it a rare find. Who knew? We are delighted that it is now with someone who can appreciate it and put it into usable condition.